Russia launched three members of the International Space Station, ISS, crew, on Thursday. The Russian commander Aleksandr Samoukutyaev was accompanied by NASA astronaut Barry Wilmore and by Elena Serova, the first Russian woman launching into space in two decades. The crew is expected to work on the station for five and a half months and return to Earth in March 2015. 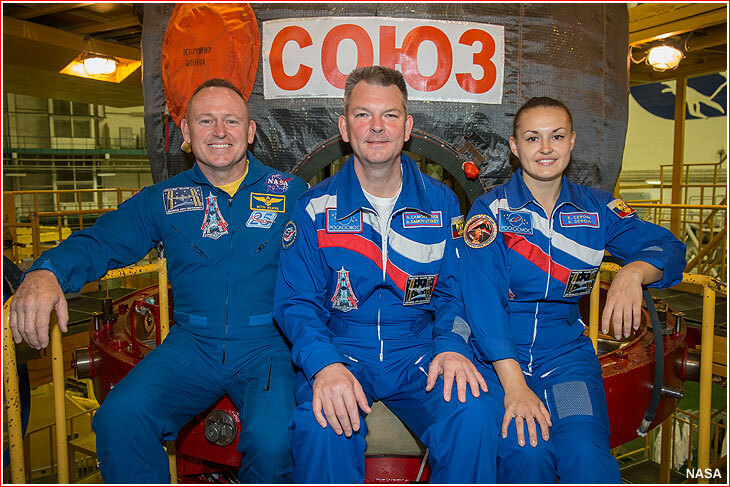 During their mission designated 40S in the ISS schedule, the trio will represent the 41st and 42nd long-duration expeditions onboard the outpost. Above: At the Baikonur Cosmodrome in Kazakhstan, Expedition 41 Flight Engineer Barry Wilmore of NASA, left; Soyuz Commander Aleksandr Samokutyaev of the Russian space agency, Roskosmos, center; and Flight Engineer Elena Serova of Roskosmos pose for pictures Sept. 13 in front of their Soyuz TMA-14M spacecraft during the first of two "fit check" dress rehearsal activities. Serova will become the fourth Russian woman to fly in space and the second in 20 years. 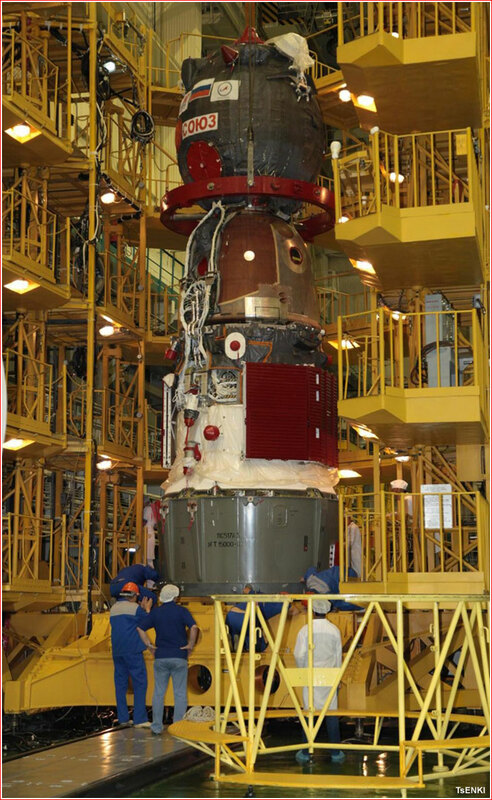 2014 May 26: Soyuz TMA-14M delivered to Baikonur Cosmodrome's Site 254 for pre-launch processing. 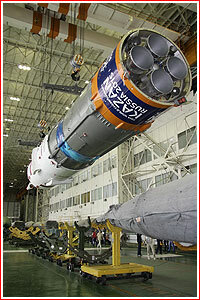 2014 Sept. 22: Soyuz TMA-14M integrated with the Soyuz-FG launch vehicle inside the assembly Site 112. 2014 Sept. 23: The launch vehicle and the spacecraft are rolled out from the assembly building at Site 112 to the launch pad at Site 1. Above: Soyuz TMA-14M during pre-launch processing in Baikonur on Sept. 16, 2014. The liftoff of a Soyuz-FG rocket took place as scheduled on Sept. 26, 2014, at 00:25 Moscow Time (4:25 p.m. EDT on Sept. 25) from Site 1 at Baikonur Cosmodrome. 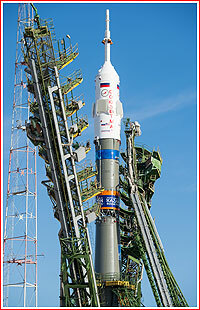 The launch vehicle was carrying the 7,220-kilogram Soyuz TMA-14M spacecraft with a three-member crew. Following a vertical liftoff, the Soyuz-FG rocket headed east to enter an initial orbit with an inclination 51.6 degrees toward the Equator. The four boosters of the first stage separated slightly less than two minutes in flight, following by the separation of the second stage 4.7 minutes after the liftoff. The third stage inserted Soyuz TMA-14M into a 200 by 242-kilometer parking orbit after slightly less than nine minutes of powered flight. 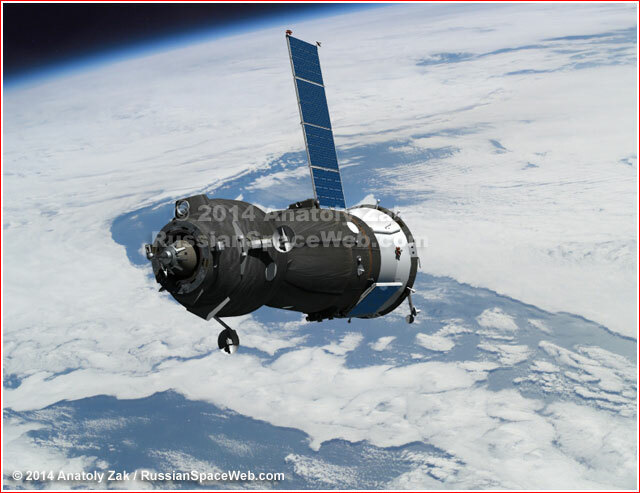 An artist rendering (top) and an actual photo of the Soyuz TMA-14M approaching the station with a stuck solar array. The spacecraft successfully entered orbit, however its left solar panels did not deploy. The Soyuz could still make it to the ISS under its scheduled four-orbit rendezvous profile relying on its onboard battery, before it needed to be recharged, sources said. 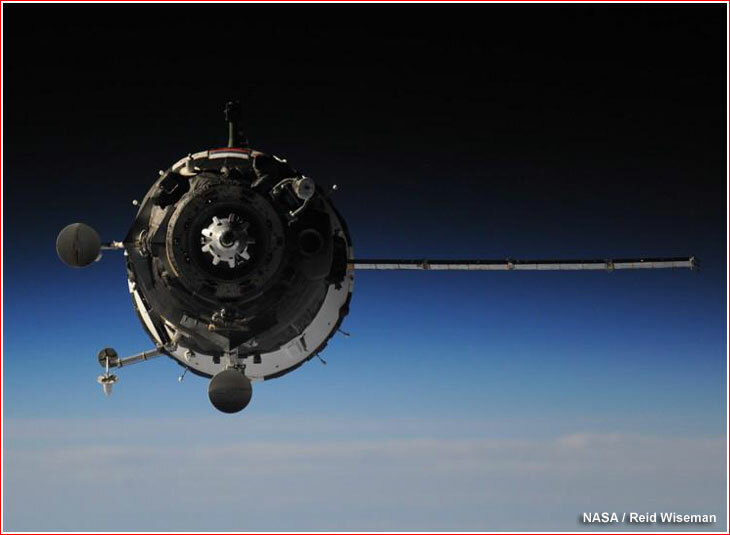 The Russian mission control in Korolev directed the station crew to conduct careful photographic documentation of the affected panel during the approach of the spacecraft to the station. According to NASA there was some concern about the overheating of the spacecraft due to array blockage of the radiator, however the real data showed no major problems. The Soyuz TMA-14M conducted four engine firings during the first and second revolution around the Earth in order to rendezvous and dock at the MIM2 module, a part of the Russian segment of the ISS at 06:16 Moscow Time on September 26, 2014 (10:16 p.m. EDT on September 25). 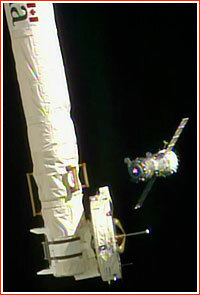 The actual docking took place five minutes early at 06:11 Moscow Time. During the docking, a slight shaking of the spacecraft was enough to activate the release mechanism on the stuck solar panel and completely deploy it. 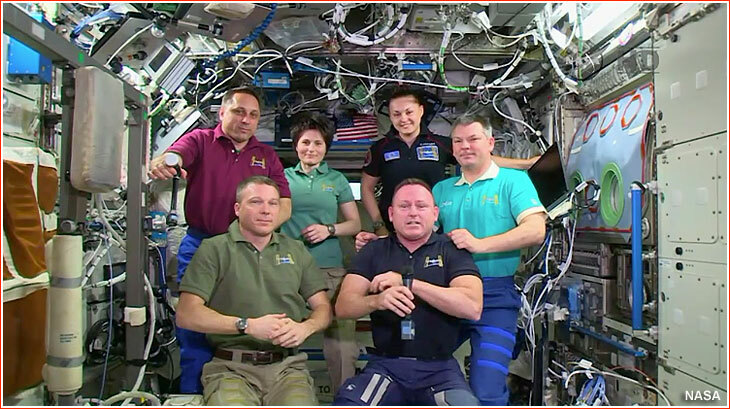 The crew of Soyuz TMA-14M formally transferred the command for the ISS to the crew of Soyuz TMA-15M preparing for the transition from Expedition 42 to Expedition 43. 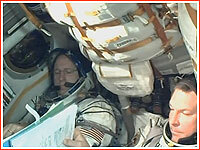 Hatches between the station and the spacecraft were closed around 2:34 p.m. Houston Time on March 11. 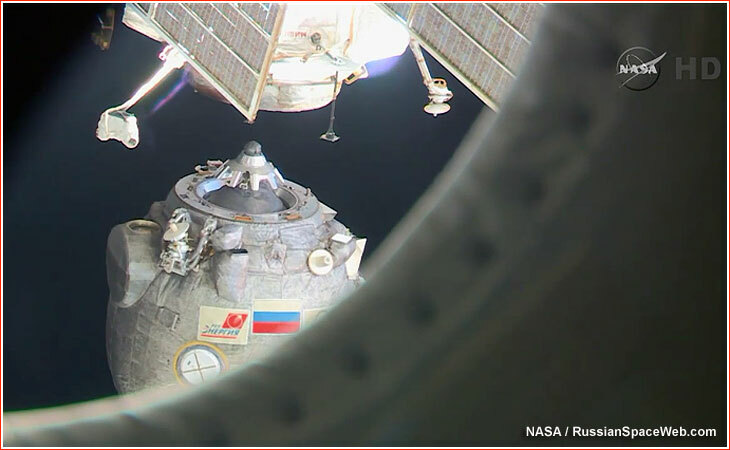 The Soyuz TMA-14M undocked from the zenit-facing port of the MIM2 Poisk module on the Russian segment of the ISS on March 11, 2015, at 5:44 p.m. Houston Time, (01:44 Moscow Time on March 12, 2015), as the outpost was flying over Southern Mongolia in view of Russian ground control stations. 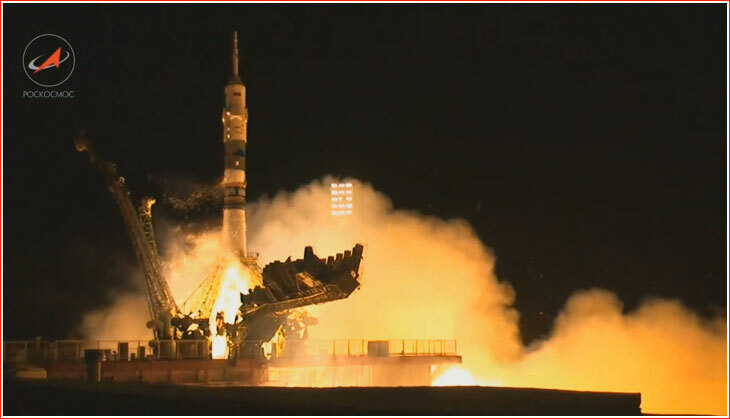 It was the 93,290th revolution for the ISS and the 2,597th revolution for the Soyuz-TMA-14M spacecraft. Second Soyuz separation maneuver: 01:48:20 Moscow Time. Russian search and rescue teams were deployed at airfields in Karaganda and Dzhezkazgan in preparation for deployment to the landing site located 146 kilometers to the southwest from Dzhezkazgan in Kazakhstan. 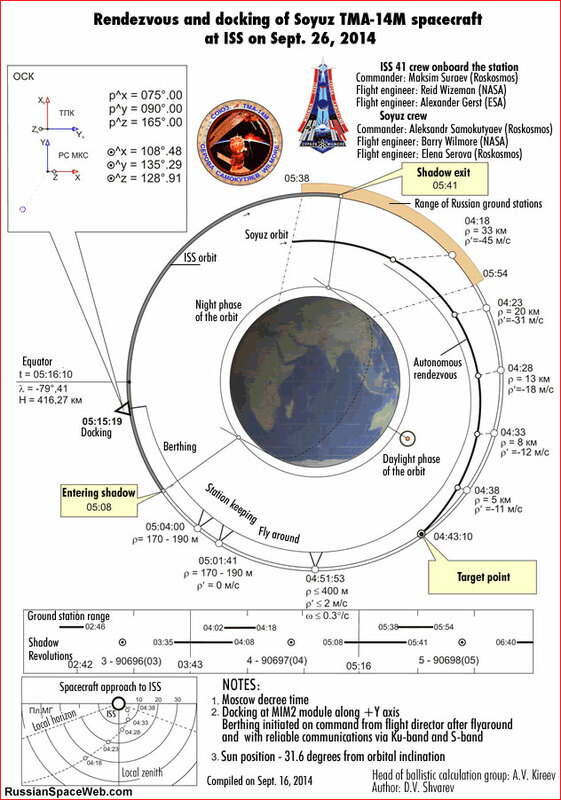 Sun was to rise at the landing site at 04:42 Moscow Time, or 26 minutes before a scheduled touchdown of the descent module. The sunset was to take place at 16:22 Moscow Time. Weather forecast predicted few clouds and winter temperatures at the snow-blanketed landing site, according to NASA. 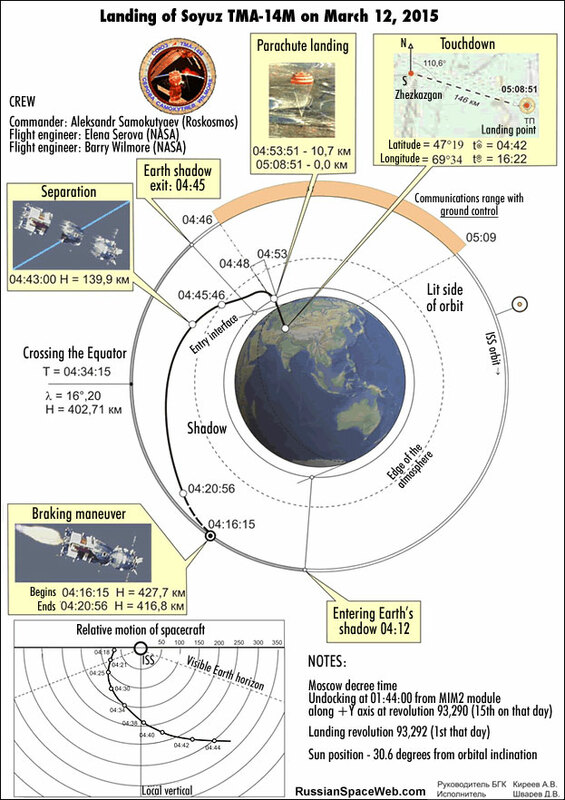 When Soyuz TMA-14M reached a distance of 12 kilometers from the station, the spacecraft initiated a 4-minute 41-second deorbiting maneuver. All communications with the spacecraft were interrupted around a minute and a half through the engine burn but were re-established after the separation of the descent module from the habitation module and the instrument compartment. The landing of the spacecraft was confirmed around 10 minutes after the scheduled touchdown time, even though heavy fog prevented live TV cameras from homing onto the descent module during the entire descent process. However rescue teams reported the capsule in upright position after the touchdown.